(Nanowerk Spotlight) The extremely high electron mobility of graphene – under ideal conditions electrons move through it with roughly 100 times the mobility they have in silicon – combined with its superior strength and the fact that it is nearly transparent (2.3 % of light is absorbed; 97.7 % transmitted), make it an ideal candidate for photovoltaic applications (see: "Ultrathin transparent graphene films as alternative to metal oxide electrodes"). As such, it could be a promising replacement material for indium tin oxide (ITO), the current standard material for transparent electrodes used for electrodes in LCD displays, solar cells, iPad and smart-phone touch screens, and organic light-emitting diode (OLED) displays for televisions and computer monitors. Recent research suggests, though, that doping is a necessity to harvest the full potential of graphene (see for instance: "Are There Fundamental Limitations on the Sheet Resistance and Transmittance of Thin Graphene Films?"). The challenge then for researchers is to find suitable fabrication techniques for high-quality graphene flakes that exhibit high charge mobilities. A German-Spanish research team has recently published a paper in Angewandte Chemie International Edition "Towards Tunable Graphene/Phthalocyanine–PPV Hybrid Systems" where they present a chemical approach towards non-covalently functionalized graphene, which is generated from vastly available and low-priced natural graphite. "So far, functional molecules in terms of photo-active groups were introduced by interactions with graphene oxide, and thus, have to tolerate the harsh reduction conditions obtain non-covalently functionalized graphene oxide," Jenny Malig, the paper's first author, explains to Nanowerk." Advantageous in our approach is the direct exfoliation of graphite by ultrasound treatment and concomitant non-covalent functionalization supported by the photospectroscopical characterization in solution." Malig, a PhD student in Dirk Guldi's group at the Friedrich-Alexander-Universität Erlangen/Nürnberg, worked together with her colleagues and collaborators from IMDEA-Nanociencia at the Universidad Autónoma de Madrid. She notes that non-covalent exfoliation of graphite mediated by surfactants is well documented and, in principle, conceptionally transferred from carbon nanotube chemistry. "Also π-surfactants like amphiphilic perylene or pyrene dyes were already used for stabilizing graphene sheets in appropriate solvents" she says. "Encouraged by these results, we turned to more complex molecules like phthalocyanine oligomers, which have never been used before in solution processes." For this work, knowledge transfer from work done in the field of carbon nanotube chemistry in Guldi's group ("Tuning and optimizing the intrinsic interactions between phthalocyanine-based PPV oligomers and single-wall carbon nanotubes toward n-type/p-type") was crucial for the preparation of the non-covalent functionalized graphene sheets nanohybrids. 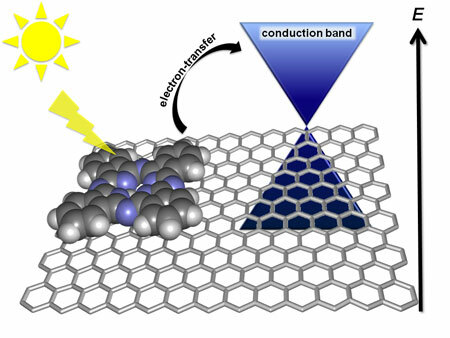 However, the investigation of novel electron donor-acceptor hybrids involving graphene is far more challenging than the exploitation of carbon nanotubes in the same context. The reason for this, in terms of applicability to solar cells, is primarily the challenge of photophysical characterization of the nanohybrids. "In contrast to non-covalently functionalized carbon nanotubes, graphene – considered a zero-gap semiconductor – exhibits no significant optical transitions in the visible region, which limits the characterization techniques" says Malig. The team circumvented this problem by selecting a spectator molecule to assist in identifying and visualizing electron donor-acceptor interactions. "Interestingly, we were able to quantify and prove the formation of the radical cation species of the 'spectator', which for the first time clearly demonstrates the electron transfer from the excited dye to the graphene sheet," says Malig. "In conclusion, the latter has emerged as a convenient tool for testing a broad library of dyes. It demonstrates that graphene has the potential to act as an electron acceptor." In general, such novel monohybrids materials are suitable for new electronic materials, especially for printed electronics. Non-covalent functionalization of graphene gives rise to cost-efficient novel materials which possibly exhibit new and altered properties that differ from non-functionalized graphene. In addition, the functional groups mediate exfoliation and solubility of graphite/graphene. "Devices in which the electronic structure of graphene is tuned by chemical functionalization in an appropriate manner are thus conceivable where all of the assemblies consist entirely of graphene," says Malig.